Amaco Glazes and Velvets underglazes. 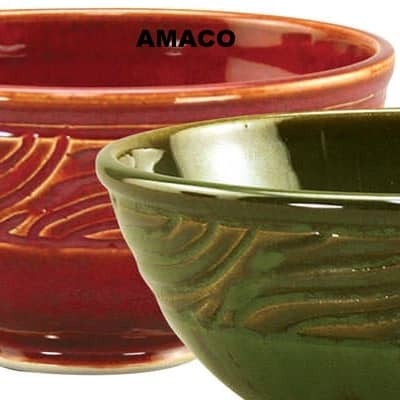 Although AMACO® Opalescent Glazes may be used on any nmclay clay, they develop their greatest opalescence and most interesting textures when applied over red burning red earthenware Red Clay No. RL6. The AMACO® Opalescent Glazes have a high gloss finish when fired. Best results are achieved with three or four applications of glaze. On textured ware, the glaze flows thin on relief and thick in incised areas, giving an added dimension on the surface. Arroya glazes from AMACO® are textured and produce a unique "carved" effect when fired. Use over gloss and matte unfired glazes. Arroya glazes are best applied with a fully loaded fan blender for all-over coverage or with a sponge when using a pouncing method. The heavier the application, the larger the break-up effect and the more matte the finish. Satin Mattes break slightly over edges and texture and boast a soft satin feel. These glazes are formulated to be 100% mixable (except for Orange and Red, which have a different base.) Use Clear Satin to lighten color tones, Satin Black to create shades, and Satin White to create tints. Potter's Choice glaze series were intended for the serious ceramicist! These eye-catching glazes add flowing colors and effects to smooth or textured pots, with great results at Cone 5/6. When using these glazes you have access to all of pottery making history. Check out the PC Layering charts to see all the amazing results you can try in your own studio! Saturated color, dependability, and versatility make Velvets as popular for professionals as they are for children. Velvets fire true-to-color as a Cone 05/06 underglaze or fired to Cone 6. Some colors remain true as high as Cone 10. •Can be used with or without glaze- Food Safe with proper glaze. Shino glazes can also be layered with our PC line of glazes for different effects.